Aung San Suu Kyi MP AC (Burmese: ; MLCTS: aung hcan: cu. krany, /aʊŋˌsæn.suːˈtʃiː/, Burmese pronunciation: [àʊɴ sʰáɴ sṵ tɕì]; born 19 Juin 1945) is a Burmese opposeetion politeecian an chairperson o the Naitional League for Democracy (NLD) in Burma. In the 1990 general election, the NLD wan 59% o the naitional votes an 81% (392 of 485) o the seats in Parliament. She haed, houiver, already been detained unner hoose arrest afore the elections. She remained unner hoose reest in Burma for almaist 15 o the 21 years frae 20 Julie 1989 till her maist recent release on 13 November 2010, acomin ane o the warld's maist prominent poletical prisoners. Suu Kyi received the Rafto Prize an the Sakharov Prize for Freedom o Thocht in 1990 an the Nobel Peace Prize in 1991. In 1992 she wis awairdit the Jawaharlal Nehru Awaird for Internaitional Unnerstaundin bi the govrenment o Indie an the Internaitional Simón Bolívar Prize frae the govrenment o Venezuela. In 2007, the Govrenment o Canadae made her an honorary ceetizen o that kintra, the fowerth person ever tae receive the honour. In 2011, she wis awairdit the Wallenberg Medal. On 19 September 2012, Aung San Suu Kyi wis an aa presentit wi the Congressional Gowd Medal, which is, alang wi the Presidential Medal o Freedom, the heichest civilian honour in the Unitit States. On 1 Aprile 2012, her pairty, the Naitional League for Democracy, annoonced that she wis elected tae the Pyithu Hluttaw, the lawer hoose o the Burmese parliament, representin the constituency o Kawhmu; her pairty an aa wan 43 o the 45 vacant seats in the lawer hoose. The election results wur confirmed bi the offeecial electoral commission the followin day. On 6 Juin 2013, Suu Kyi annoonced on the Warld Economic Forum’s wabsteid that she wants tae run for the presidency in Myanmar's 2015 elections. Syne acomin State Coonsellor, Suu Kyi haes faced internaitional creeticism ower her inaction on the persecution o the Rohingya fowk in the wastren-Burmese Rakhine State an the resultin humanitarian creesis. ↑ "Aung San Suu Kyi". Oxford Dictionaries Online. Retrieved 19 June 2012. ↑ Sharpe, Penny. "Daw Aung San Suu Kyi". Penny Sharpe MLC. Archived frae the oreeginal on 30 March 2010. In 1990, Suu Kyi stood as the National League for Democracy's candidate for Prime Minister in the Burmese general election. The NLD won in a landslide but the military junta refused to hand over power. ↑ "Canada makes Myanmar's Suu Kyi an honorary citizen". Reuters. 17 October 2007. Retrieved 28 December 2010. ↑ "Update: Mawlana Hazar Imam is made an honorary citizen of Canada". The Ismaili. 19 June 2009. Archived frae the oreeginal on 4 January 2011. Retrieved 28 December 2010. ↑ Recipients of the Wallenberg Medal. Wallenberg.umich.edu. Retrieved 2 April 2012. 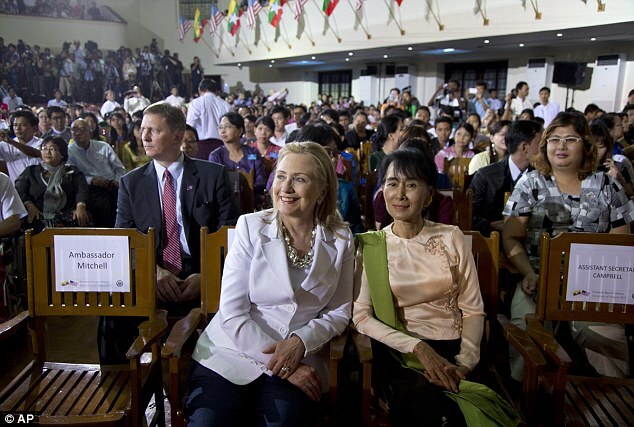 ↑ "Burma's Aung San Suu Kyi given US Congressional medal". 19 July 2012. ↑ "Burmese Parliamentary Elections". Voice of America News. 4 April 2012. Retrieved 5 April 2012. ↑ Maierbrugger, Arno (6 June 2013). "Suu Kyi wants to run for president". Inside Investor. Retrieved 7 June 2013. "Aung San Suu Kyi collectit news an commentary". The Guardian.